Arsenal boss Arsene Wenger wants to silence his critics with victory at Galatasaray after being booed by some fans following the 3-2 defeat at Stoke. With the Gunners lying sixth in the Premier League, 13 points behind Chelsea, Wenger was jeered when he boarded a train after Saturday's loss. 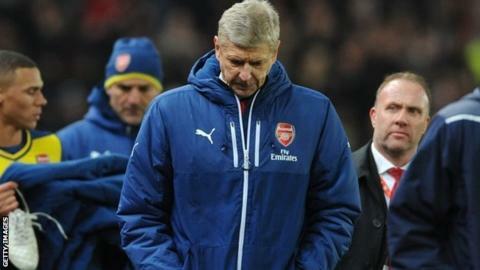 "We have to cope with that criticism," said Wenger. "I am a competitive person. What is important is the next game and responding in a strong way." The Frenchman added: "It is part of our job here, you cannot always look for excuses. We are down. Everyone feels it. "When you have a disappointment you respond in a strong way, that is what competition is about." Arsenal, who ended a nine-season trophy drought by winning last season's FA Cup, face Galatasaray in their final Champions League group fixture on Tuesday in Istanbul, having already secured their place in the last 16. However, three defeats in their last five Premier League matches have left them four points off the top four this season. Wenger was the target of criticism during the recent 1-0 win at West Brom, when fans unveiled a banner that read: "Arsene, thanks for the memories but it's time to say goodbye." Marc, a member of the Arsenal fans group Black Scarf Movement, told BBC Radio 5 live: "The mood is really split, I've never known the fan-base to be so divided. "There were physical fights among Arsenal fans taking place in the stands after the game against Stoke because the fans are so divided and so passionate about their cause. "There's one side who want Wenger gone, there's one side who are sticking by him and it's coming to blows which is ridiculous. But, that's where we are."